The unique Malware-IDS technology in the background guard provides the first line of defense against individual attacks by highly specialized Trojans that cannot be recognized by signature-based anti-virus software. These types of Trojans are a favorite attacker tool for spying on Online Banking access data and company secrets. The Malware-IDS is also able to block Rootkits effectively. One of the best antivirus solution for classic users or beginners, very easy to use, no bloat and fancy features. How it can be advertised as 'a none bloat' solution when the download is around 235 Meg against for example ESET @ 90 is beyond me. It also has high memory use, if none of these are an issue it may be the solution for you. I prefer lighter solutions & layed security. Current V9 gets 5 stars, I highly recommend this software, the support is Excellent, the software has one of the highest ratings in detection, this is what everyone needs! @sec:- I have 16 GIG of RAM on this PC & I'm one of the ones complaining, if you understood how MS Windows management works it's not as simple as having 16 GIG so I can do anything, Windows memory does not work that way. It uses ridiculous amounts of memory & more importantly so it's unnecessary, it's also one of the most confusing & counterintuitive interfaces on an AV solution I've ever used and I've had Windows running since version 3.0 & used Emsisoft from it's very beginning, when it was A2 (squared) & it's not getting any better - There are far better solutions, Try Eset Smart Security for example along with Malwarebytes (get a lifetime licence while you still can). I have been using both Emsisoft's Anti-Malware and their Online Armor Firewall for a few years now (3 to be exact). It is the only information security software I have needed for those 3 years. I don't understand how some can claim that it is a memory hog; but then again, I have more than 582mb of RAM on my machine (unlike the the ones complaining). The only thing Emsisoft can't control when it comes to installing malware is the operator. If you download something and Emsisoft pops-up a warning, quit ignoring them and it may work better for you! The anti-malware is only as good as the fingers controlling it via the keyboard. Look at all the antimalware awards Emsisoft has been getting lately...they can't all be wrong! I had no indication that this product stopped viruses from downloading onto my computer. The web site does not explicitly say that this product prevents known malware from downloading. 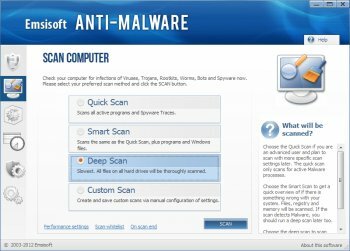 Emisoft admits, uncharacterstically accurately, that once malware is on your machine more often than not it can't be removed. Avast on the other hand blocks known malware from downloading. It's stopped alot of malware from downloading onto my machine and missed one that nothing could identify. The Emisoft web site, which is filled with hype, never actually explicitly lists specifically what this product does and does not do. I caught the program using a full 500,000 M of RAM. That is way too much, and would hang any computer more than a couple of years old. The company uses scare tactics. For instance, a prominently displayed article on the web site claims that ransomware will infect even your backup drives, and there won't be anything you can do. Other IT experts are saying that while Ransomware exists adn can do that it is rare and not much of a threat. It's also unclear how Emisoft would prevent ransomware since it doesn't stop malware from downloading. The theme of Emisoft's current newsletter is their claim that NBC's web sites are infected with malware. Emisoft Antimalware costs twice as much as most other antivirus software, and you have to buy a second product for sandboxing, which Avast's standard price product includes. Out of interest & because I've just done a C:\ image I installed this program to see if it was more intuitive, less complicated (I don't mind complicated if it's necessary) & to see if Emsisoft had managed to fix the slowdown on this fast muticore PC. The result over the last hour is: - It's still takes an age to setup, it still is unnecessarily complicated & still locks this PC up while scanning & does slow it down when running in the background (iTunes running in the foreground slows a PC down less) What do you expect for a program over 200 MEG in size though? Mbam wipes the floor with it, now imaging back to remove every byte of this garbage, & I won't be trying it again and have tried it off & on since it was A2. Pros: - A dual-engine real-time scanner (homemade & Bit Defender). - A cloud reputation network. - A Behavior Blocker with anti-ransomware capabilities and a Windows Firewall fortification feature. - A Web Filter to prevent access to malicious sites. - A very reactive and professional customers support team. - An emphasize toward privacy. Cons: - On low-end machines, resources usage may be high, but can be improved via several settings options. Bottom Line: One of the best antivirus solution for classic users or beginners, very easy to use, no bloat and fancy features. This is a nice piece of software. Anti-virus/Anti-malware all in 1 package. $40 is the price but they have many license specials for way less. It took me a while to get all the setting tweaked to my machine but when they are right, EAM blocks many bad things and is very intuitive, is updated many many times a day and runs just fine with other A/V & A/M software on the same system. I would say they have lost the plot but to be honest they never had it to start with ~ And I have a full license for Emsisoft that remains unused for the reasons above ~ Very expensive also - Nuff said? -False positives all the way. Malwarebytes is the best one around for the moment. V 6.0 is great. It's faster and uses less system resources than before. Also I like the new GUI.